Like jumpsuits, rompers, and the simple duo of a white tee and jeans, I find co-ord sets to be just as easy to wear on hectic days. They provide a safety net of some sort because it's a no-brainer combo that you know you can always count on to make you look and feel stylish even on the busiest of days. Usually, co-ord sets consist of a top and pants or a top and a skirt, but a jacket and skirt complete this corduroy co-ord set. If you read my Nordstrom Anniversary sale post, these two items may look familiar to you. 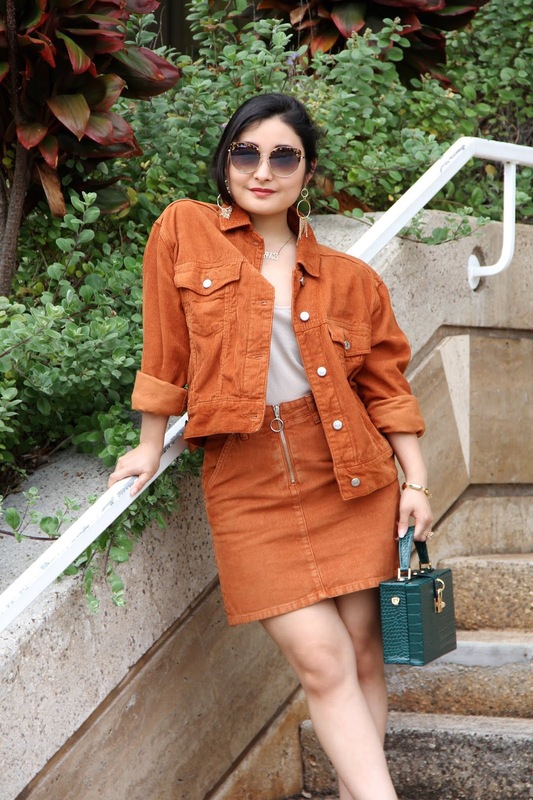 They were my two favorite pieces from the sale, so even if the rust color lends themselves to a more autumn appropriate outfit than a summer ensemble, I just couldn't wait to style them and share the final look here on Elizabeth, Marie, and Me! 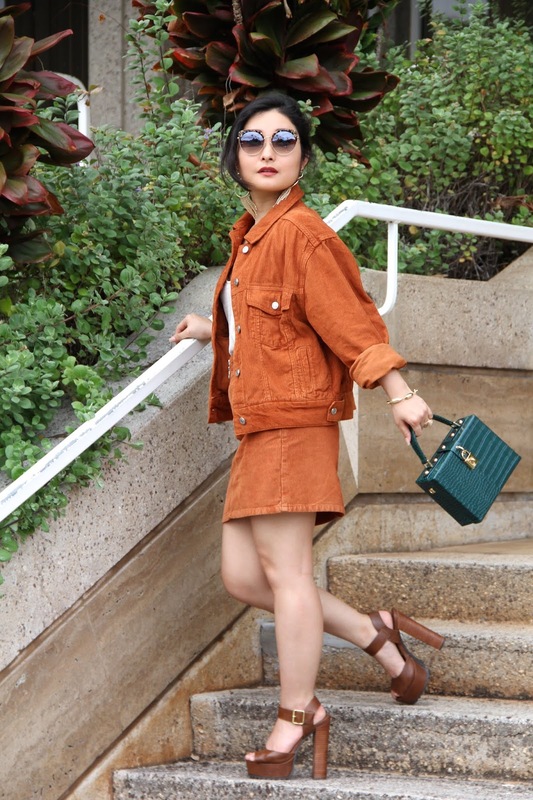 Besides the corduroy pieces, I wore a neutral beige tank (which was also from the sale) to keep the focus on the gorgeous rust-colored pieces. 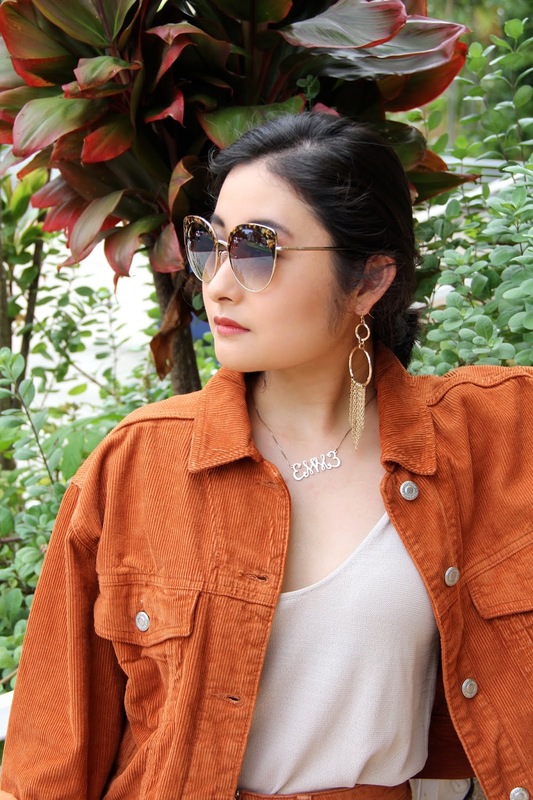 I accessorized with gold-toned jewelry pieces to compliment the warmth of the vibrant orange-brown color. I ended up choosing a pair of statement hoop earrings, my signature necklace, a geometric chain bracelet, and a ring. Although it's a whole slew of bijoux, they were dainty enough to pair together without going overboard with the sparkle. 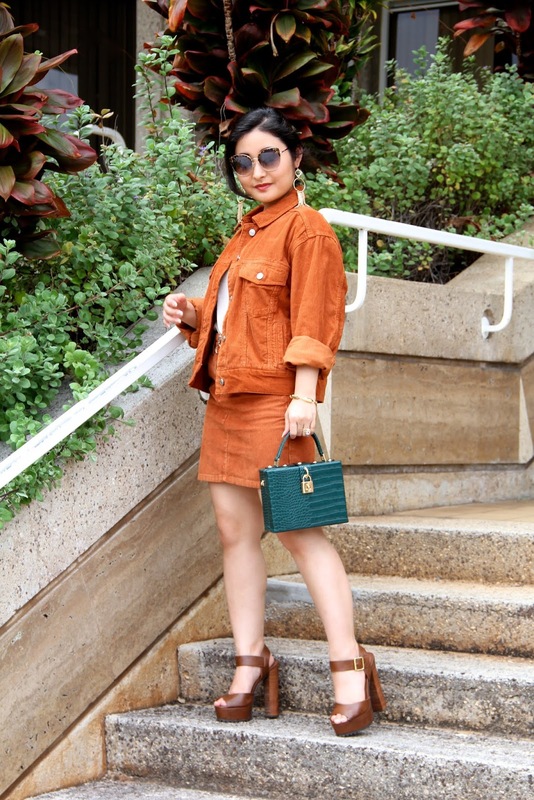 To carry through with the earthy tones, I carried an evergreen boxy faux croc purse and slipped into my favorite pair of chestnut platform heels. Finally, no look would be complete without a pair of sunnies, so I chose my brown Balmain sunglasses that I purchased from Ross for under $70. 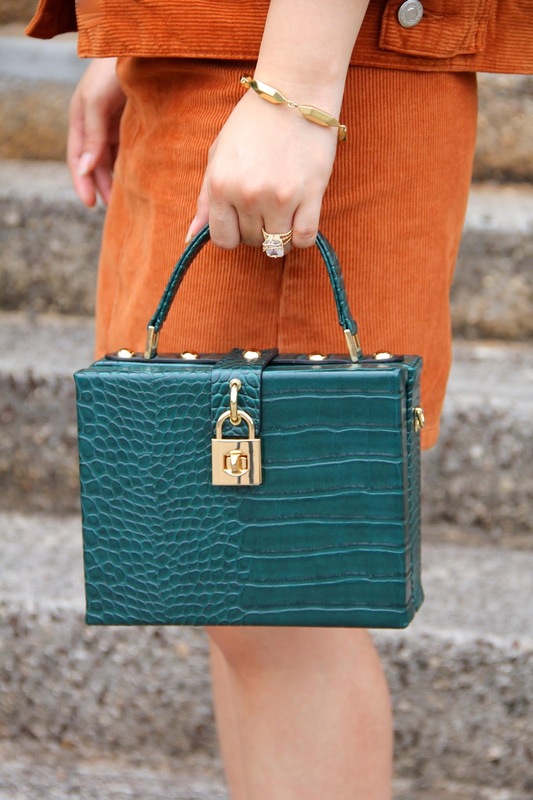 Who says that designer pieces have to cost a fortune? Sometimes discount stores such as Ross, T.J. Maxx, Marshalls, and Nordstrom Rack have those "gems," so all you have to do is look! And voila! I present to you my first pre-fall outfit of 2018! Every year I'm always excited for summer, but as soon as the heat sets in full blast, I can't wait for autumn. I mean, who doesn't love wearing jackets and coats in brisk weather while drinking a festive latte? I will be posting more summery outfits here on the blog, but I'm also itching to share more pre-fall looks. Let me know in the comment section below which season you love best: summer or fall? Until my next post, I am sending you all lots of love from my heart to yours!